The renovated Fortmiller building the way it looked last week. On the left, the downtown library. From 4 to 7 p.m. Tuesday (April 3), brothers Scott and Spencer Lepman scheduled an open house for the building at 420 Third Avenue S.W., a former funeral home they have turned into nine modern apartments and two offices. They’ve invited, among others, the city council, other members of the CARA advisory board, the planning and landmarks commissions, and the library board. 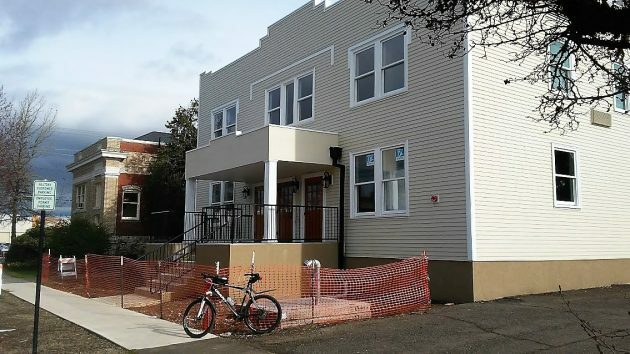 It was in March 2014 that CARA, the Central Albany Revitalization Area, approved Scott Lepman’s request for $336,000 in aid toward restoration of the building and construction of four townhouses next door, an enterprise then estimated to cost $1.6 million. City rules, it turned out, prevented the townhouses, but after considerable delays and extensions the deal was amended to include the construction of townhouses in the 200 block of Third Avenue S.E. That construction has not yet begun. The old building on S.W. Third, next door to the Carnegie Public Library, was built in 1930 as an apartment house and then converted to the funeral parlor. It was changed back to apartments and offices in the 1970s, and in recent years had fallen on hard times. The property was scheduled for a bank foreclosure when CARA approved the restoration aid — a loan to be forgiven when the project is done — and the Lepman company bought it. 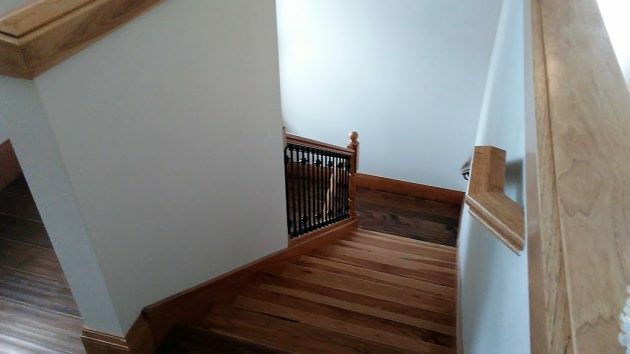 When I got a look at the units last week, I was impressed by, among other things the precise and handsome stairways and railings, the work of woodworker Brent Gerger. Other notable features include the high ceilings, a big patio for use by all the tenants, and sturdy steel railings and other outside fittings fabricated by Spencer Lepman. Kip Alan was the project coordinator. Postscript: At the open house Tuesday night, I was told the monthly rent on the apartments depends on square footage. 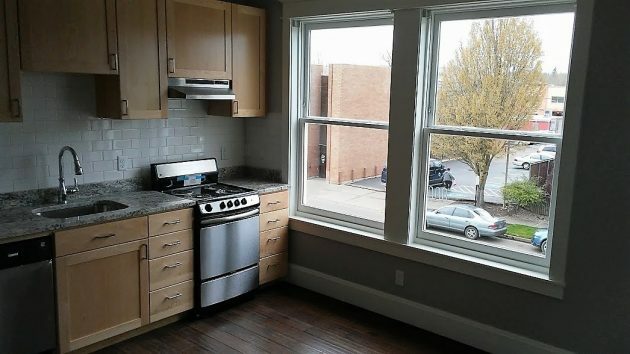 It ranges from $650 for the smallest studios to $1,095 for the one two-bedroom unit. 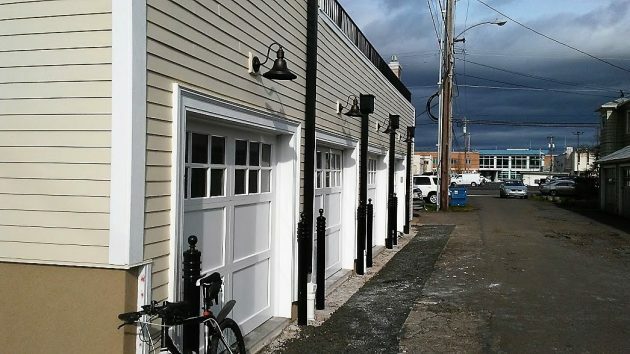 There are four garages, and they rent for $50 a month. The view from the kitchen of an upstairs studio apartment. Excellent woodwork in the stairs and railings. Four garages open to the alley in back. In the background, City Hall. Oh shoot I missed the open house. Any chance there will be another? I’m sure you can call the Lepmans and get a tour.